So, hey guys, this Fall is all about the Boots, booties and how many different ways you can wear them! I get my crushin’ on shoes from my Mom who seems to collect them! Getting Grunge Inspired Look footwear this season is where it is, but you want to do it with style and I have found the right grunge-inspired boot for the season. Since I am in college, I am always looking for footwear that is trendy, easy to match-up and will take anything I wear and change it into a pretty cool looking outfit. What I have found is a shoe that actually has its own voice, lol, if that is possible because it just shouts out, “trending.” This is how I am getting the grunge inspired footwear look this season, lavishly living boots out loud. You look at that picture and you just want to grab them off my feet right? Not gonna happen, but you can get your own, let me share with you what I have found! 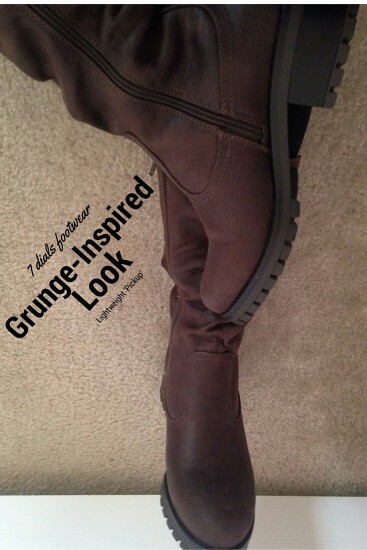 Where did I shop to get into the trending grunge-inspired footwear. I actually found a new line of footwear with Seven Dials Footwear. You have to check them out. I thought, “what is the best way to show all of you the boot up close and personal?” Here is is in my video, check it out. You want to know more about Seven Dials Footwear? Do you dare check out Seven Dials Footwear? Trust me, the site is addicting and if you so LOVE yourself some shoes and booties, you may not be able to separate your eyes from the page and probably will order up as much as you can find. The latest in fashion trends, loads of comfort and the value, is what you are goign to find and they are all affordable. I think these are super cute books. I would love to have some for this fall/winter. The boots I have don\’t fit anymore, guess my feet grew with my last pregnancy. Boots are extremely essential to face the weather during the fall. Wonderful post. Boots are extremely essential to face the weather during the fall. Wonderful post. Loved it. I looked at their website and they have some really cute booties. They’re affordable too! I really love boots, I think these are great especially for the coming winter. Boots are my first choice for footwear, lol. I would wear it if it’s isn’t too hot in the summer. Those boots are super cute. I love boots like that.